There has been a new development. It started with the cauldron of Japanese salad yesterday. My momma always taught me the old idiom waste not, want not and to this day it gives me an acutely unhappy feeling to throw something out, unused. I’m a frugal person. I’m the person who puts the toothpaste container against the counter and squeezes with every possible ounce of strength just to get that last little, minty bit of paste onto my toothbrush. I’m the person who swishes water around the bottle of conditioner before dumping it over my head just to get those last remnants of product out of the bottle. I’m the person who eats smoothies because that’s the only acceptable way to ingest half rotten fruits. I’m the person who… you get it. Now, this cauldron of salad combined with my extreme frugal reluctance to waste meant that it wasn’t a one meal deal. Oh no. I’ve been eating away at that sucker every chance I get because Japanese salad goes horribly awry after just a few days. So in the course of two days I’ve eaten it for 3 meals. Three meals. That’s two extra mushroom meals than I originally signed up for. The rules lay it out that one meal a day must have mushrooms. So I’m technically allowed to toss those shrooms aside and carry on as if they were never there… but I would know. It just doesn’t seem right to go out of my way to remove the mush when this challenge is all about eating them. So I left them in. It’s gotta land me some challenge karma points right? Although I think I’m turning Japanese (I think I’m turning Japanese, I really think so!) for the amount of this salad I’m eating, it wasn’t actually the meal designated for Day Number 5. Nope, due to some sportsing, tonight’s meal is pizza pops with mushrooms in it. 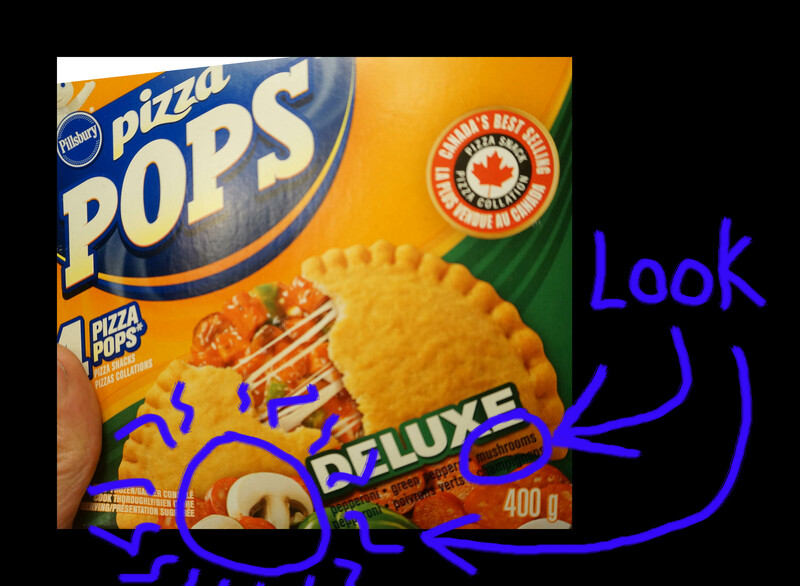 A pizza pop is enclosed. You’ll never know when a mushroom pops up until it’s too late and that bad boy is in your mouth and you’re caught off guard as the bomb goes off. Now, although you were told there were landmines, there actually aren’t any, but you don’t know this so you can’t relax, not until your very last step is placed because each step you take without one going off means the odds just got worse, and then after a painfully agonizing long period of time you’ve made it through and it turns out there weren’t any after all. Talk about stressful. So although I didn’t have a bad-go with the mushrooms themselves, I had a particularly taxing time trying to anticipate their next move. Pizza Pops – mushrooms, pepperoni, tomato paste, green peppers, and a whole smack load of fillers and preservatives and fancy names for cheese. It’s a little bothersome that there is no ingredient that just says “cheese”. What is the gooey stuff that I’ve been calling cheese all this time? This can’t be good.